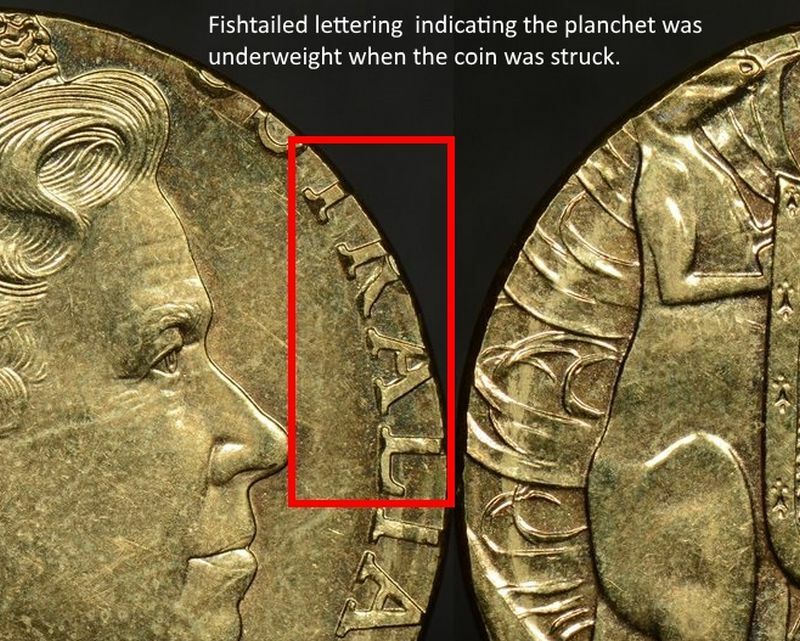 Above we can see an Australian 50 cent that has been struck on a wrong coin planchet. This error 50c is the wrong weight, wrong colour and the wrong shape. A regular 2014 50 cent should weigh 15.55 grams, be silvery in colour (copper-nickel to be exact) and have a 12 sided (dodecagonal) shape. This coin weighs 6.55 grams, is made of brass and is round. This error coin is uncirculated so was likely pulled from a coin roll before it entered circulation and was so strikingly out of place that it was put aside. We’ve had this coin XRF (X-ray fluorescence) tested and it came out 95.07% copper and 4.93% zinc which is the composition of brass. It was a possibility that if the composition was aluminium bronze (92% copper, 6% aluminium and 2% nickel) that it could have been struck on a (6.6g) $2 planchet, but this didn’t turn out to be the case. We looked into what other coins or medals the Royal Australian Mint was striking at the time this coin was made and no other planchets match this coin. We’ve concluded that it’s most likely that foreign blank contamination occurred at the factory where the coin blanks used by the Royal Australian Mint are sourced, Poongsan in South Korea. This company is the world’s largest coin blank manufacturer producing coin and medal blanks in all kinds of alloys including brass and copper-nickel. A foreign blank contaminated the barrel of blanks at the supplier and went on to be struck as an Australian 50 cent creating this very special, super rare error coin.